Pipe and drape is used to set up some kind of backdrop, display, or boundary for many different events. You simply choose the height and set up you need, then hang the drapes of your choosing from the pipes. Then, voila! Here are some of the most common ways pipe and drape is used. There are countless ways you can use pipe and drape at a wedding. You can hang up sheer drapes for a wedding, white drapes for a wedding, or some other kind of wedding drapes for a photo backdrop, enhance the setting, or create separation. They can be used for the ceremony, the reception, or for both! Trade shows are often rather large events where hundreds of different businesses are in the same room, pitching their companies to potential clients. They are very valuable as 99% of marketers said they found unique value from trade show exhibits that they didn't get from other marketing mediums. 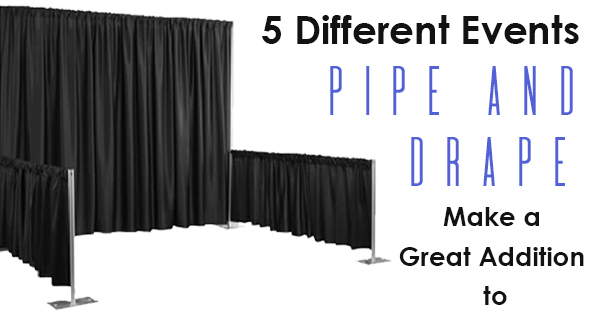 You can use pipe and drape to set up a trade show booth to divide exhibitor spaces. Pipe and drape is regularly used in churches, whether they are well established or start-up mobile churches. It is used often as church backdrops for special events like weddings, baptisms, Christmas service, and more. Pipe and drape has also been used as coverups for construction and a way to separate different ages groups during events like vacation bible school, etc. During many corporate events, you'll find that someone important in the company needs to make a speech of some sort. Pipe and drape is often used as the backdrop for these important speeches. It can also be used for photo opportunities with certain employees as well. Schools, colleges, and universities alike use pipe and drape for a variety of situations. They can use these tools as a backdrop for the school play, or a nice background during a graduation ceremony. You can choose from a variety of colors for the drapes, and their versatility comes in handy for such occasions. Pipe and drape is often used for weddings, trade shows, church backdrops, corporate events, and school events. Give us a call today if you have an upcoming event that is in need of some pipe and drape!